There is no substitute. 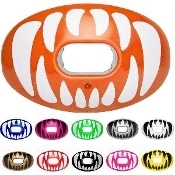 The Oxygen Predator Football Mouthguard is the original patented mouthpiece designed and developed by athletic, dental and medical experts to deliver superior airflow and better performance. No boiling required, boiling is a thing of the past - this is the new standard in comfort, protection and performance. Available with convertible strap.